Failing foundations can happen for a variety of reasons. We have discussed several issues in previous posts and will continue to do so in future posts. But when you have a failure, what should you do? One historically bad idea is to bring in bags or trucks of concrete to pour under the existing home. The thought behind this is – Concrete is a solid base, it is used for footings, it spreads the load out, and it will fill all the voids. And while these are all true of concrete, the one aspect you do not see listed is the weight of concrete. Concrete weighs around 145 lbs./cubic ft, although depending on the mix it could be more or less. If you multiply by 27 you will get the weight by cubic yard (which is a standard for concrete trucks) = 3915 lbs/cubic yard. (as a side note: soil can weigh between 60-120 lbs/cubic foot). We will use an example of a corner of a home that is showing settlement on a 10×10 corner of the house. If a contractor decided to pour concrete under this corner, he may want to pour it one foot thick and may go 2-3 feet into the existing home. If that’s the case then he would have poured 40-60 cubic ft of concrete (or 2-3 yards). This equates to adding between 7,830 and 11,745 lbs to the corner of your home. Stay with me – because an average single story brick house on a slab weighs around 1,141 lbs per foot (or for this 10×10 area – 21,679 lbs). Basically, the contractor just increased the weight of your home by 50% – and this is using conservative numbers of what the contractor poured, and a very modest home (a 2 story brick house on a basement would have a weight of 3,656 lbs per foot). We have heard stories and seen jobs where the amount of concrete poured under a corner of house is 6-7 yards or around 25,000 lbs. All of this to say that if your home is settling due to poorly compacted soils, loose soils, organic debris, builder debris, water issues, etc then the soil does not have the adequate bearing capacity to support your home. If the soil was not good enough to support the existing structure, why would anyone add a 10-30,000 lb anchor to an already sinking foundation? Once more, what do you think this will do when you have to repair the house after the concrete is poured? This repair – which would have cost a few thousand dollars to begin with, will ultimately cost several thousand dollars – not to mention you may not be able to lift a structure once you have added all the additional weight of concrete. Before you decide to go with a contractor that wants to pour concrete under a corner of your home, or if you are thinking of pouring concrete under your home, do some research about helical piers and resistance piers. If you are a homeowner, then your largest investment depends on how you decide to repair a sinking foundation. Background: Helical and Resistance Piers are considered deep foundations, which mean they both penetrate areas of poor soils to reach soils of adequate bearing capacity. They do not add weight to your structure, and require little disturbance around your home to install. They last for years and years and typically come with long warranties to protect against any future issues. 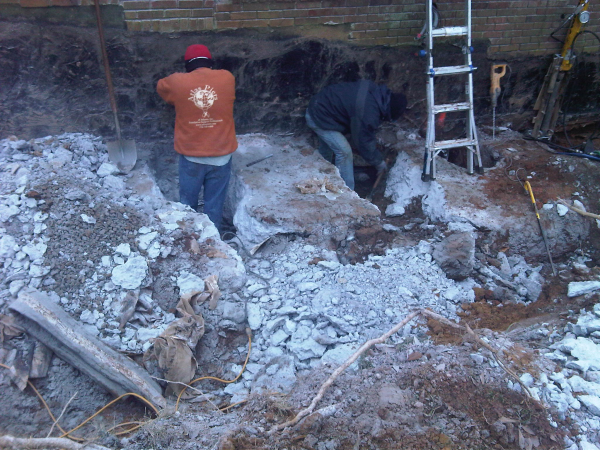 Atlas Piers provides services in repairing foundations. We lift and stabilize houses all across Atlanta and the State of Georgia. We have been in business for over 20 years and have seen other companies come and go. If we can’t lift a house – it can’t be lifted. Visit our home page or call us @ 770.740.0400 for more information. Garage Column sinking issue? Cracks above the garage doors?